The Wii U is flawed. I won't pretend that it isn't and I won't apologize for it either. If the system had an animal equivalent, it'd be that of a damaged pound puppy. And yet, it's my go-to next-gen console for gaming. The reason for that is simple: It actually has fun games. Right now, Nintendo's curious console basically exists on borrowed time, bolstered by the thin cushioning of loyalists' money and a string of exclusive first-party titles with familiar names (e.g., the Marios and Zeldas). Nintendo's been more than clear that it sees the Wii U as a transition point on the way to the sleep- and fatigue-tracking technology it's pursuing under that vague "quality of life" initiative. We all know the Wii U's end is near. Those pitiful sales numbers, recent quarterly profit notwithstanding, are like a final, damning prognosis. It's just a matter of time before the company pulls the plug. So, rather than pummel Nintendo's console softball into obscurity, I'm here to slow clap as it marches to the grave. There's nothing smart about the Wii U and that, I believe, is its greatest selling point. The console doesn't offer you the option to bark voice commands at it in the hopes one will land, flail your hands in the air (to the embarrassed delight of your housemates) to trigger menu actions or even the ability to sit shirtless and livestream gameplay to Twitch. It won't play DVDs (what are those, anyway? ); it doesn't have a music-streaming app you can play while mid-game. It's not even particularly attractive to look at it (I'm being extremely kind here). It just plays games and it does so very well. If you love games, that's exactly what should matter most. 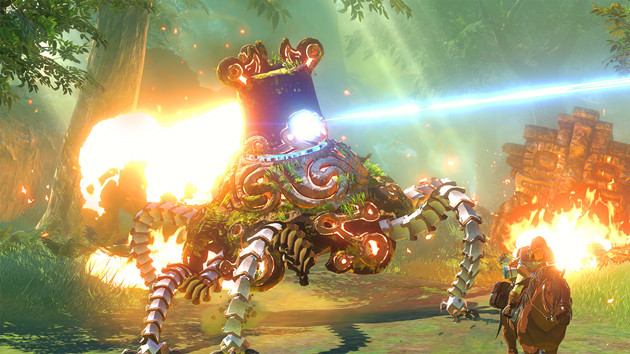 The upcoming installment of The Legend for Zelda for Wii U will employ an open-world mechanic. Sure, Nintendo's reliance on an endless parade of franchise retreads can get a bit tiresome, but let's give credit where credit's due: Every effort this generation has been a masterwork. I, for one, could do without a Mario resurrection every six months -- give me Splatoon already! But despite that cheap trick of slapping a known, globally adored mascot onto a new title for guaranteed sales, there's always an innovative and engaging game play mechanic driving the experience; a mechanic that has been tested to death for maximum fun effect. I can deal with the delays in Nintendo's first-party release schedule because I know I'll get a definite return on my investment: amusement. Rather than pummel Nintendo's console softball into obscurity, I'm here to slow clap as it marches to the grave. How can you hate on Mario Kart 8? That game is an exercise in pure delight and also a strong argument for local multiplayer (read: playing with friends and family in the room with you). Retro Studios' treatment of Donkey Kong Country stands as a reminder of how challenging and rewarding platformers used to be. The Wii U-exclusive The Wonderful 101, despite being completely and unfairly glossed over by everyone for its steep learning curve, shines as the preeminent example of what developers can do with the GamePad. (Alright, so maybe I lost a few layers of skin on my thumb from frantically and repeatedly drawing symbols on the screen, but that was the result of an eight-hour, nonstop gaming session. The game is just that good.) Then there's the cash cow that is Super Smash Bros. for Wii U, a surefire system seller; Bayonetta 2, yet another key exclusive that should have PS4 and Xbox One owners yearning; Hyrule Warriors; Pikmin 3; Super Mario 3D World; The Legend of Zelda: The Wind Waker HD; Little Inferno; Shovel Knight. All of the above titles are well worth your dollars for the smile they'll plaster on your face. And I haven't even touched upon the Virtual Console library of classic Nintendo gems -- hello, EarthBound! -- that are perfectly suited to playing solely with the GamePad. I know, I know, Nintendo's been a bit daft about making the same quantity of VC titles available to the North American eShop. I'm also keenly aware that there's no PlayStation Plus-like subscription service to net you access to all of those titles for a monthly fee. I don't even have to argue why that'd be the wisest move for the company's bottom line. Like I said, there's nothing smart about the Wii U, but at least the games, however few, are there. Oh yeah, and it's backward-compatible with the Wii that started it all. The Game Boy Advance title Metroid Fusion is available as part of the Wii U's Virtual Console. I own Nintendo's portable 3DS XL, but almost never use it because it makes my giant, adult hands cramp. Which is why I adore the Wii U GamePad's chunky, spacious design and its second-screen purpose. I can recline lazily on my couch or bed, pick up the GamePad and indulge in a session of Super Mario World. (Full disclosure: I bought the larger battery and you should, too. It's a must, not an option.) There's no lag or image corruption to worry about like with PS4 Remote Play on the PlayStation Vita. The GamePad either works at a comfortable distance or it doesn't. It's also suited to pick up and play as you can suspend any VC game without waiting for a save point. Nintendo, as a gaming company, won't be the same. And I'm mourning that passing already. Now for the bad that's actually good: Streaming video on the Wii U is perhaps the worst experience you'll get out of the three next-gen consoles and I'm totally fine with that. The lack of an Ethernet port means I can't guarantee the strength and stability of my stream, and second-screen implementation on the GamePad (I'm looking at you, YouTube and Hulu Plus) is a hot mess. What's more, the resolution of the GamePad's screen can be downright frustrating if you like your Netflix in full HD. I won't even broach the subject of browsing the internet -- let's just forget that's an option. Bottom line: If I want to stream video, I turn to my PS4. For games and nothing else to distract, it's the Wii U all the way, baby. Except that it's nearly time to say goodbye. 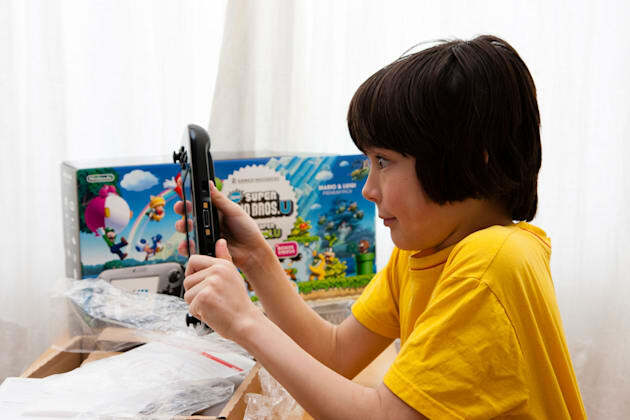 A young boy unboxes the Wii U. Every time I boot up the system and see my Mii avatar drop into WaraWara Plaza waving at me, I wave back a wistful hello. The poor lil' guy doesn't know it, but he's not long for this world -- at least, not within the confines of the Wii U. He, my Mii, will be back in another incarnation; likely one that encourages me to get exercise and a good night's rest. But it won't be the same. Nintendo, as a gaming company, won't be the same. And I'm mourning that passing already. It's all of our collective fault, really. Nintendo's traditional stubbornness to adapt to emerging trends and embrace cutting-edge tech, its continued disavowal of third-party developers and our insistence that the company bend to our bloodthirsty, shoot-'em-up thrills or give up the ghost and go third-party have dug that grave. I'm sure the day will come, however distant it may seem now, when a Mario or Zelda title will be available on Sony's and Microsoft's consoles, but I'll be hanging my head when it does. The Wii U may be dumb, but it was an innovative push in a different direction. A Nintendo that doesn't innovate gaming hardware and software is a Nintendo I don't want to know, and neither do you. You just don't know it yet.